Finding out I was pregnant last July was happy surprise #1. Two weeks later, rushing to the emergency room, convinced I was miscarrying, I left the hospital with surprise #2. I was pregnant with twins! Complete shock and a permanent smile is all I remember. Dreaming of preparing the nursery, naming the babies, guessing their sexes, buying clothes, telling all my friends were the only things that occupied my mind. Honestly, I did not stop to think about some very complicated situations that I would soon face. First, I am an American living in Barcelona, Spain. My life has taken some twists and turns and my heart took me to Spain. I fell in love with the greatest guy in the world and three months later, we were pregnant. Not being a citizen and ultimately living in limbo and instability, Marc, (the greatest guy in the world) took the reigns. European healthcare is phenomenal. Once all the paperwork was completed, any service or appointment for my whole pregnancy was booked at no cost! The hospitals are state of the art and the staff is a mix of older experienced doctors with young eager ones. 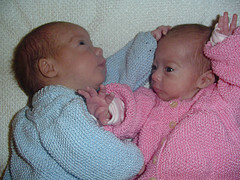 It seems everytime I had an appointment I had an ultrasound and walked away with another picture of the two miracles. As my really easy pregnancy moved into the 5th month, I began to read more and more. Mostly about the stages of the babies in my belly and preparation of when the babies were home. Really I focused on reading how to organize my life with twins, schedules, and advice from many books and a best friend who had twins the previous year. All the excitement led me to ignore, or rather not educate myself or even consider a few major things,: cesearans, premature birth, and the NICU. January 13th at 1am. This is where it began. 2 months before my due date, I went into labor. 32 weeks along and boom! Everything happened so fast that night, I started with a bit of unusual pain at 1am and by 5am both my son and daughter were born. It was an emergency C-section, but to me it was like being abducted by aliens. Maybe if I was prepared it would have been less traumatic but all I remember is staring at the big round clock over my left shoulder. Nobody is allowed in the room during a cesearan in Spain. So there I was alone, whisked off, clenching my fists. After the epidural was admitted, I remember calming down a bit but feeling like the whole experience was surreal. I felt so disconnected. My babies were born so tiny and after they were pulled from my stomach they were immediately sent to the NICU. I didn't see one part of either of them, no fingers, no toes, I didn't even hear a cry. The doctors were kind and professional, they assured me the babies were OK but needed to be on respirators immediately. Completely understanding and appreciative- I breathed a sign of relief, was sewn up and sent to my room to rest. I didn't see my babies for the first time until almost 48 hours later...this broke me down. Never did I think this could be a possibility, as I always dreamed of having a baby and having it placed directly next to me after delivery. The first time I laid eyes on them I was wheelchaired to the NICU. The pain from a cesearan is excruciating. I saw my daughter first and suddenly the pain disappeared. My emotions were mixed- extrememly emotional, helpless, elated, and guilty. Marc had spoken with the doctors earlier that morning and relayed to me that we should be prepared for the babies to be in the hospital for at least one month. That seemed like an eternity, and when I was released from the hospital, I went home emptyhanded. I felt so unworthy, incompitant, and I did not feel at all like a mother. For 30 days we went back and forth three times a day to the NICU. We bonded with our new babies initially through an incubator eventually graduating to holding them with monitors attached. We bonded with other families around us. After a couple weeks I turned over a new leaf and realized what a blessing this experience really was. The wonderful nurses had put our children on schedules!! Schedules that would have been impossible to implement ourselves being new parents and parents of twins!! All the moping and "why me's" soon turned into gratitude and we learned why when we brought our babies home. Lola and Nicolas are now 3 months old, healthy, strong, and beautiful. If I would have known then what I know now, would I change anything? Yes, I would have educated myself on the complications of twin pregnancy, and the possibilities of the NICU stay. Through reading stories like mine from other women who have had similar experiences. All of these blessings that touched my life have been indeed blessings in disguise. Im carrying twins, identical and at 33 weeks. I had a faint idea tat twins r mostly premature n the possibility of NICU but didnt take it seriously until i read ur experience. Gonna b better prepared after reading this. Just hope things go well. I just gave birth at 32 weeks to our identical twin girls and once spent 3 weeks in NICU and the other 4 weeks. There was 1 1/2 difference between the bigger and the smaller twin, and its amazing how every ounce gained is a cause for celebration. I would have never thought that gaining 60grams daily was such a wonderful news as I have with my little one. NICU experience is a roller coaster. It brings out all sorts of emotions and feelings, stresses and anxieties. It is very important I think to educate yourself on the NICU and how it works when expecting twins because chance are you'll be spending some time there. I am also an American living abroad but came to the US at 31 weeks to have my babies because at 27 weeks I was looking at a possible Csection due to Twin to Twin Transfer Syndrome. It was very scary to think of delivery at 27 weeks but thankfully they made it to 32 weeks. They'll be one month old tomorrow and are home and doing well. We are so blessed. Thank you for sharing your story, I am 8w3days pregnant with idenical twins. It has just been a roller-coaster of happy feelings. I was thinking of opting for a c-section at 34 weeks but reading as much as I already have, I think I will leave everything to God and try wait until the last day. I never thought about having to stay in hospital because my first baby boy (3 turning 4 in March 2011) was born in the most easy way one can imagine. Easy 3 hour labour, one push and he was born. I will educate myself more about twin pregnancies and the complictions before I make final decision. I hope Lola and Nicholas are healthy and bubbly. Your story is amazing and scary all at the same time. I am 25 wks pregnant for the 4th time with twins and had uncomplicated vag births. So I have gone through this whole pregnancy thinking what could go wrong? I've done this before, How much harder can it be. Well I am starting to find out that yes it is different-luckily still now complications but I can feel the difference in my size and my body- how much quicker every thing seems to happen. After reading your story it was kinda an eye opener and now I'm nervous and scared for something to happen early. I was not doing anything different I work 16hr shifts and running everyday with the other 3 kids. Now I wonder what should I be doing. Thanks for the insight--I plan to be a little more careful now. Your story brought tears to my eyes. I am 22 yrs old and have an 8 month old son who spent 4 months in the hospital. He has down syndrome and my rare skin disorder..... I TOTALLY know how it feels. We are pregnant with #2 and my first U/S is tomorrow... I think I"m having twins, my belly is just too big... but we'll see. I'm only 6 weeks. wow, an amazing story! it gives hope to everyone, well i know it made me feel better! my doctors have been monitoring me closely since they discovered i am having twins and although i am recieving excellent care, their worry over me is making me even more worried! i am constantly worried but preparing myself for the possibility of complications and a stay in the nicu. at least i know now that this isn't the end of the world!